Brother Jesse Blog: THE LATEST FINAL CALL NEWSPAPER: "Afghanistan: When will it end, and can the U.S. win? 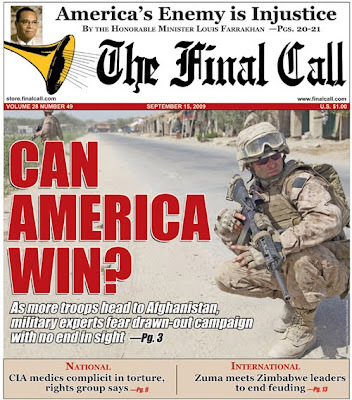 THE LATEST FINAL CALL NEWSPAPER: "Afghanistan: When will it end, and can the U.S. win? This is the latest copy of The Final Call Newspaper. It hits the streets of the country and throughout the world today. Get your copy at your local Nation of Islam Mosque or from the brothers on the street corners!